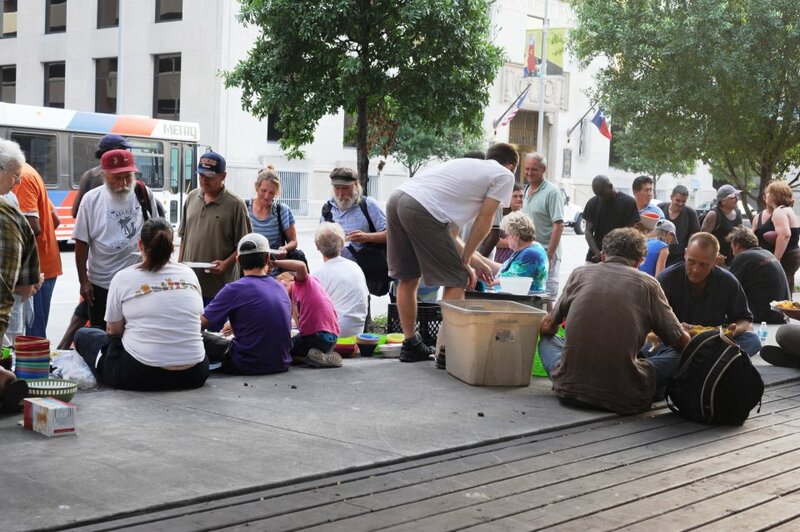 Every Monday, Wednesday, Friday at 8pm, and Sunday at 7pm, at the Houston Downtown Library Courtyard, 521 Lamar (map). We need volunteers to prepare food, clean dishes, pick up donations, and do outreach, but it all starts from attending our food sharings. There, you can volunteer for whatever needs to be done, and learn more about how you can plug in. What type of food should I bring? Any vegetarian (no meat) food can be served at Houston Food Not Bombs. We especially encourage folks to use vegan (no meat, no diary, no egg) options whenever they exist. We don’t serve any meat at Food Not Bombs. Leftover meat products are sketchy, and we don’t like the exploitation, torture, and abuse of livestock animals. Since we strive for peace, we do not want to be supporting violence against animals. A plant based diet is important to protecting the environment, and is an important way to provide as much food with as little impact on the Earth as possible. Food Not Bombs seeks to introduce the vegan or vegetarian diet to the public. 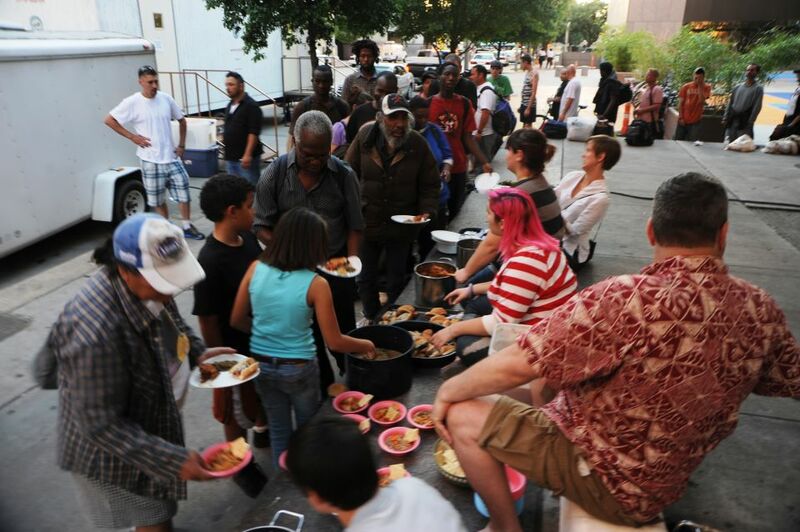 Local shelters and soup-kitchens serve predominately meat-based meals, which aren’t in line with the dietary, health, or religious preferences of some of the homeless and working poor who line up to eat our vegetarian meals. So, eggs and dairy are allowed but discouraged? If someone has an extra / left-over vegetarian food with dairy or eggs that is fresh and has been kept at a safe temperature, etc., we’d rather serve it than have it go to waste. However, we try not to financially support the egg and dairy industries, as they are highly abusive to animals and the environment. We work hard to obtain vegan food donations. When volunteers who are paying for their ingredients use eggs or dairy, we encourage them to use vegan substitutes. One of the goals of FNB is to prevent the waste of good food. FNB receives donations of fruits, veggies, and baked goods from restaurants, markets, bakeries, and individuals. In addition to un-wasting food, we also ask that people donate dried beans and lentils. 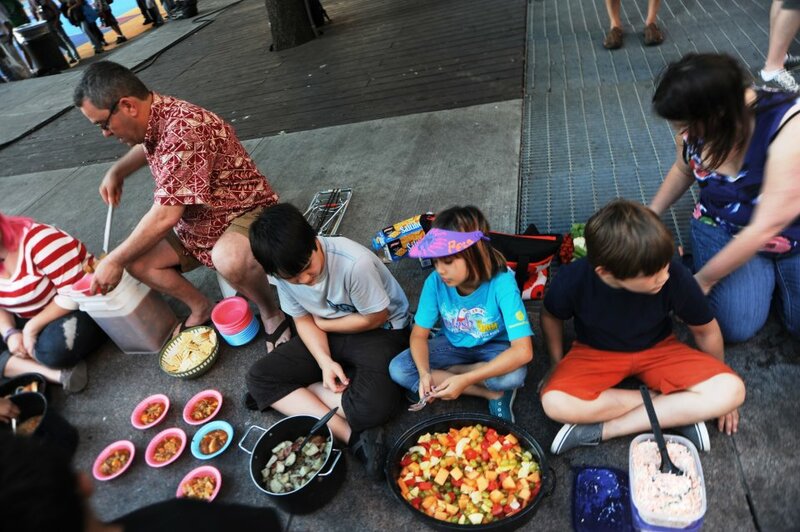 A great resource for questions about Food Not Bombs can be found on the FNB parent site. Also check / like our facebook page.